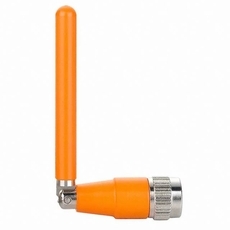 The compact TS.07, with hinged rotatable SMA connector, is an impressively high efficiency monopole antenna, providing coverage among GPS, GLONASS, and BEIDOU frequencies. With its navigation system frequency range, plus compact design, TS.07 can fit and function perfectly with vehicle tracking devices, telematics devices, and other remote monitoring systems. This 72mm long monopole antenna performs efficiently from 1561 MHz to 1610 MHz, covering GPS, GLONASS, and BEIDOU frequencies. When connected to the device ground-plane, the TS.07 is capable of achieving more than 70% efficiency. The TS.07, as all monopole antennas, works best when connected directly to the ground-plane of the device main-board or the device's metal enclosure. As with all passive antennas, using a coax with more than ~1.5 dB of loss will result in reduced receiver sensitivity. Taoglas recommends connecting the TS.07 directly to the device ground-plane for best performance. The robust brass hinge enables the TS.07 to be oriented in all directions, providing user to maximize performance with minimum effort.